Nowhere will a night out with a potential life-long love cost you as much as in Zurich. But if the object of your affection likes smokes and booze, you may not want to court in Oslo or Melbourne. 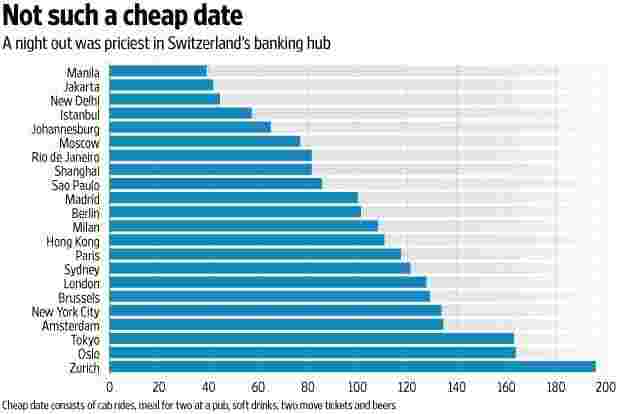 For at least the second year running, Switzerland’s banking hub took the prize for the most expensive city for a date—cab rides, dinner for two at a pub, soft drinks, two movie tickets and a couple of beers—according to Deutsche Bank’s special report Mapping the World’s Prices 2017. 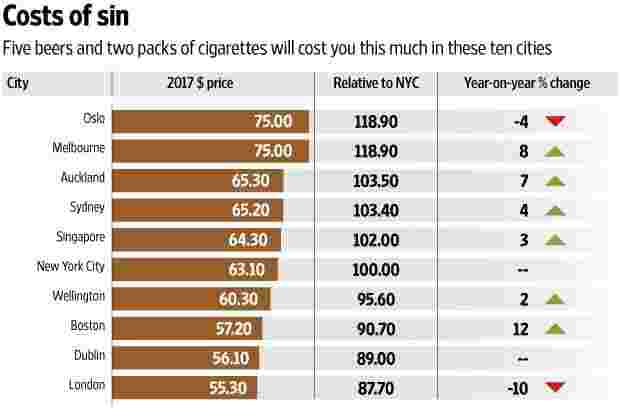 In the city home to both UBS Group AG and Credit Suisse Group AG, the night out cost $195.90—147% of the level in seventh-ranked New York. India’s capital New Delhi appears as one of the cheapest places with an average night out cost of just over $40. Deutsche Bank’s Jim Reid and Sukanto Chanda advised Zurich residents to choose their dates carefully, and marry young. It’ll be cheaper that way. The point about the research is to provide insight into whether or not exchange rates do actually adjust to correct large price differentials across countries and time, as conventional economic theory suggests they should—all else being equal. Switzerland’s place at the top of the dating list should give investors, and potential romancers, a clue: things are rarely that simple, the country’s strong currency means local prices seem sky-high for its European neighbours. For dating, Paris, the city of reasonably-priced love, was no. 17. Of the 47 places surveyed, the date was least costly in Kuala Lumpur, Jakarta and Manila. The Bad Habits index of five beers and two packs of cigarettes ranked Norway’s capital first, followed by Melbourne. At $75 dollars in both places, they were 119% more expensive than in Manhattan. Auckland came in third at 104%.